Most online video is still just a video player in a browser window, which is not utilizing much of the web’s potential for social communication or smart interactive control. 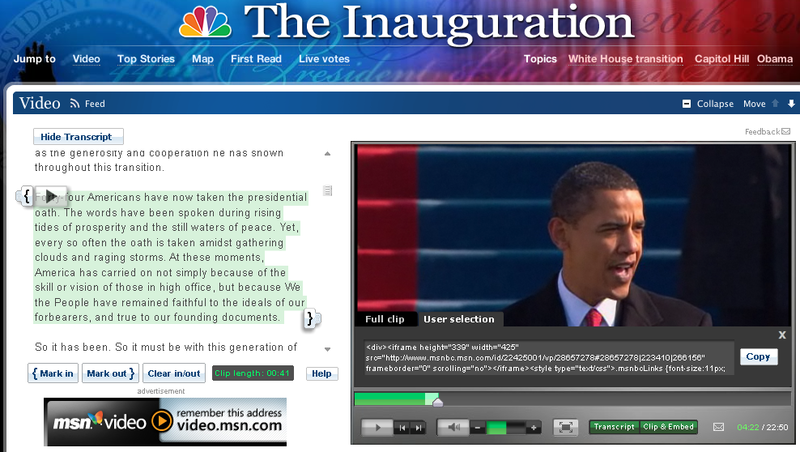 MSNBC has developed a smart way to navigate and share this video from Obama’s inauguration. The speech is transcribed so you can read it and use it as a quicker way of navigating through the video by clicking on the text where you find it interesting. This also done by other, forward-looking media sites such as New York Times, who acutally has a better design for the transcribed text. But MSNBC takes this one important step further: you can select any part of the text, (such as the green part in the screen shot above) and then click on the “Clip & Embed” button. This gives you the code for easy embedding just the selected part of the video on you blog or web site! This is a very powerful viral catalyst tool since it enables people to comment on just a part of a video clip. For example, you can write a blog post about the recession and include your selected clip on what Obama said about the recession in his speech. Everyone can be editors and help to spread videos, which also adds value to all sorts of media publishers. Select a part of the text as above, but instead of the embed code you get an URL that you can enter into a comment or blog post. When you click on this URL you see just the selected part of the video. This makes it easy to use also in microblog posts and discussion forums where you cannot put embed code. This feature could also be turned into a useful video tool: Combine the “Clip & Embed” feature with another upcoming video technology, automatic voice-to-text transcription and you get a very powerful video editing tool! Imagine uploading your video and let Flash transcribe the text of everything said in the video and display the text beside the video, like MSNBC does. Then you can use this player as a very convenient video editor, perfect for editing all kinds of video with speaking people! Now, isn’t that a nice feature. They are putting the users in control, letting them (us!) cut and edit and become journalists of our own. Media content is turning into building blocks, available for anyone to explore, mash up and combine. Mass media, on the other hand, is turning into the supplier of raw news while the grass roots of the internet (or rather the “grass tops”) are becoming the new filters providing additional commentary.